QUEEN'S ROAD: A clown can be irreverent, drenched with pathos, cruel and tender all at once. There is something about clowning that hides the vulnerability of our essential humanity and at the same time emboldens us, frees the spirit and articulates the unutterable. There is a certain complexity and layering that comes in a performance when an actor dressed as a clown knows that there is nothing frivolous or one dimensional about his part. A clown is our secret doorway to our deepest selves and also our escape from ourselves. 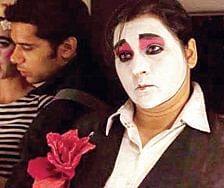 Actor Puja Saroop in her own words, has been “clowning for years” and has famously interpreted Gertrude in Hamlet: The Clown Prince. She has worked with directors like Atul Kumar and Rajat Kapoor and enjoys unconventional takes on classic tragedies. She has won many awards and her passion for clowning has taken her to Footsbarn Travelling Theatre company in France and to Helikos: Scuola Internazionale di Creazione Teatrale in Italy. On April 22 and 23, she will be in Bengaluru to take part in a series of conversations organised by the Sandbox Collective about her craft and spoke to City Express about her life and work. I am the youngest of three children. My plan was to join the World Bank after graduation but doing a small part in a play changed all that. I have been doing theatre since 2003 and did my MA in Theatre Arts from Mumbai University. I have also done a three year theatre course. I feel, more than the idea of acting, the fun and excitement of playing different characters and trying different imaginary voices make theatre and acting so exciting. My first break was a TV show for children called No kidding. It was directed by Barry John for DD Metro when I was in Class 7 in Delhi. But many years later in 2003, it was Noises Off, a play directed by Atul Kumar that brought me closely in touch with the Mumbai theatre scene. There are so many things that make theatre so exciting for me. I love the process of creating a piece which is sometimes like piecing a jigsaw puzzle together, where you try and figure out which piece goes where and finally many pieces come together to create that one complete image. Sometimes it feels like you are a detective hunting for clues as you try and work out a character, trying to understand how to play a character. I find the presence of a live audience electrifying, it makes each moment on stage so much more thrilling (except of course when their phone rings or in the middle of a blackout, their face lights up because they are texting someone!). Also because it is live, you have to be so alert and present because accidents do happen on stage and you just have to carry on regardless. Every theatre group has interesting stories about co-actors skipping scenes on stage or forgetting entries, or a chaiwallah walking onto the stage in the middle of a scene. In Noises Off, during one of the shows, an actor dislocated his shoulder and was in too much pain to continue and his understudy who happened to be in the audience watching the show and wearing similar colored pants, stepped in and finished the show. What is most amazing about this story is that the audience had no clue, they thought it was part of the play. Theatre has also led me to so many amazing people over the years, who have become my friends, including Atul Kumar and Rajat Kapoor.They have both been my directors, my co actors and also pillars of support at different points of my journey. They have taught me so much about the process of creating theatre and also about life. Atul as a director instinctively knows how to help actors to give their best. This is a skill I would like to develop. As a co-actor his rigour and madness is infectious. Rajat watches each and every show of Hamlet: The Clown Prince with a fresh perspective every single time! It is an enriching experience being directed by him because he takes on the role of a facilitator and gives you time and space to find your footing as an actor. The clown is a universal emblem which truly celebrates and owns its imperfections, its naivety, its shortcomings, its fears and plays with them all. My fascination with clowns comes from different experiences. It comes from putting on the red nose and then having the liberty to say or do things that I as an individual, might feel shy of saying or doing. I have also been influenced by some amazing clown work that I have seen. For example UK based Nola Rae and the way she handled the theme of dictatorship and the role of the mob in a play was a life changing experience for me. Working as Gertrude too was such a wonderful process, but we are still trying to understand what a clown really is. I am also very fortunate to have been trained by a very gifted ‘clown mid wife’, Giovanni Fusetti, the Founder of Helikos International School of Theatre. If my version of Gertrude is different from what you have seen earlier, it is because I am playing Gertrude through the lens of a clown called Bouzo who is an alcoholic clown , used to be a brilliant performer but not anymore. This character is heartbroken and just hungry for love. It is interesting how in the play, the interactions of the clowns within the context of them performing Hamlet throw up engaging ideas. For example, there is a scene where Bouzo puts the clown playing Hamlet across her knees and spanks him! I am really looking forward to this event because it is open to all. It is a way of creating opportunities for dialogues between different groups/communities of people. I have too many theatre friends and I would like to engage with people who don’t do theatre. The discussion will be on understanding what is clown and how each one of us has a clown within, whether we like it or not!